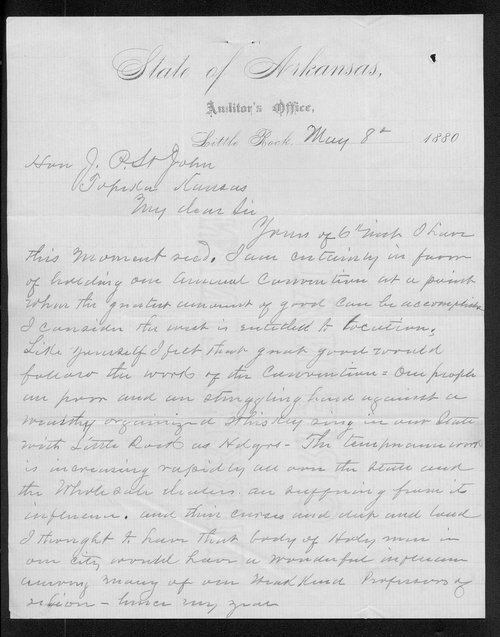 This letter to Kansas Governor St. John is from J. L. Palmer of Little Rock, Arkansas. Mr. Palmer offers his views on a meeting place for the next Annual Convention, and laments the difficulties faced by the poor people of his region, struggling against "a wealthy organized whiskey ring." The letter is written on stationery for the Auditor's Office, State of Arkansas. Palmer was involved in the temperance movement.